The email list is one of the most important assets that a blogger owns. 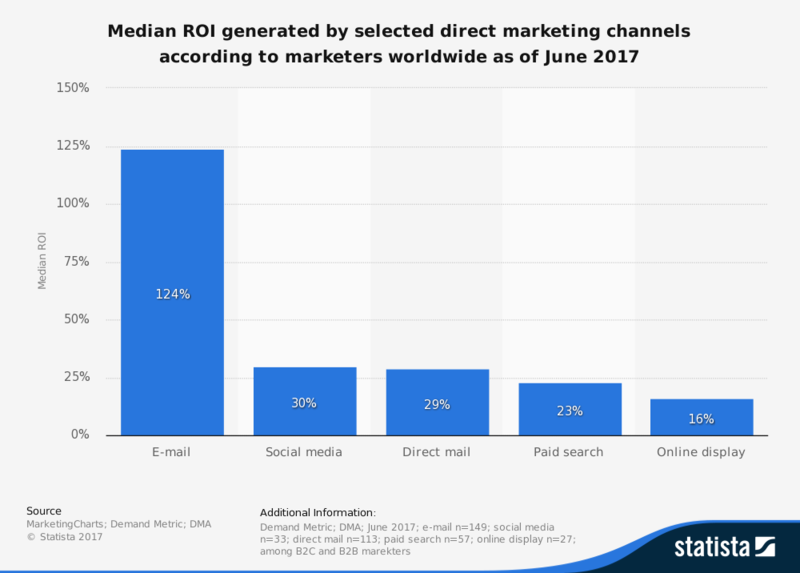 Email marketing has the highest ROI, by far, of any marketing channel. Most bloggers have plenty of room for improvement regarding the email captures on their blogs. Many pro bloggers, like myself, have been able to double and triple the opt-in rate with just a few tweaks to their calls to action. In this blog post, I will be breaking down how to strategically place pieces of social proof around your opt-in boxes, which will instantly create a psychological perception of trust. The element of trust plays a major role in whether a visitor will be comfortable in handing over their email to you. Most people that come to your blog are visiting for the first time. Unless you are a major brand name, they will not recognize you. You are essentially a stranger asking them to give up their personal information. On top of this, it has been proven that people are always reluctant to be the first one to do anything. If you do not have social proof around your call to action to join your email list, then each person is thinking to themselves that they could be the first to give up their email to you. A couple of simple tactics will move you from being seen as a stranger to a trusted resource. These take less than five minutes to execute. If an email list is beyond 1000 subscribers, then you should include this number. Here are a couple examples of how other websites have weaved this number into the call to action for their email list. Join 31,112 other awesome people that get new posts by email! Join 100,812 good-looking folks who get our latest content. Join the 1,527 other small business owners that subscribe to get our weekly marketing tips. Join 6,517 DIY chefs that get our latest recipes emailed to them. Always remember to use a specific number, like 8,593 as opposed to over 8,000. The more specific the number, the more believable it is. HelpScout does a great job of incorporating this tactic in their opt in slide in. Not everyone will have an email list beyond 1,000 subscribers. A workaround for this problem is to create a call to action that combines the number of email subscribers with the number of social followers. Your social followers number will include the total number of people that follow you on Twitter, Facebook, Instagram, LinkedIn, and Pinterest. If you still do not have enough social media followers to break one thousand, then you can run a Facebook ad that promotes your Facebook page. The most cost-effective way to get over 1,000 people to follow your Facebook page is to target the geographic location of Bangladesh. When you create your ad, you will set your maximum cost per click to two cents. It will cost you around $15 to $20 for 1,000 legitimate followers. I would recommend against buying fake followers, which will cost more than the $20 Facebook ad campaign. You are better off getting real English-speaking people from Bangladesh truly interested your Facebook page. 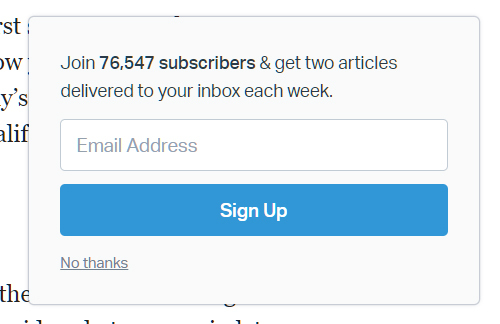 The two best locations to place a testimonial in your email opt-in boxes will be above your call to action or below your subscribe button. Whereas a sales or landing page will need at least three separate testimonials, your email opt-in only needs one to make a difference. CoSchedule does an exceptional job of incorporating their testimonial between a descriptive title and their call to action. Right before that testimonial is a small profile pic of the user being quoted. There are two best practices for using a testimonial in and around your email capture. I always shake my head when I see a website that uses anonymous testimonials or ones with just the first name. These shallow testimonials will actually decrease your conversion rate. You want to use a concise testimonial that will fit nicely above or below your call to action. If you have no testimonials, then there are several ways to get one. Number One: Look through your Twitter mentions. Usually, there will be someone that has tweeted something positive about your blog or a post you published. The great thing about using Twitter mentions is that it comes with the person’s name and picture. Number Two: Sift through past emails from your contact page. Almost every question that comes through my contact page usually starts with a positive comment about my blog, podcast, or my online course. Number Three: Start a Facebook group. I run a private Facebook group just for people that sign up for my online course. I have always made a point to answer every post and question within 24 hours, 365 days a year. Because I am prompt and deliver thoughtful actionable answers, the group is loaded with positive testimonials. If you do the same, you will have an endless supply of your own testimonials to choose from. The Twitter mentions, contact page emails, and Facebook group discussions are all examples of impromptu testimonials. These will always be genuine and concise, which is perfect for displaying right next to your email subscription forms. That will do it for this growth hack.